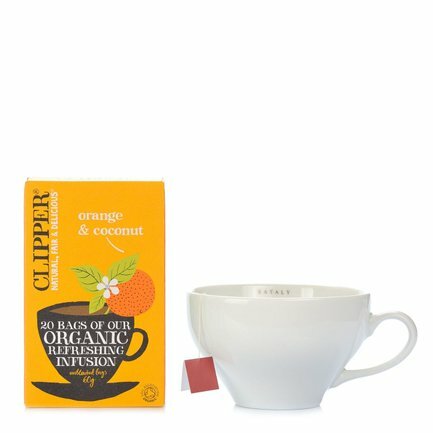 Clipper Orange and Coconut Infusion offers all the perfume and flavour of fruit, for a relaxing drink any time of day. Intense and pleasantly fragrant, this Orange and Coconut Infusion offers a sharp tang of orange and the rounded creaminess of coconut. Naturally caffeine-free, for a refreshing break, any time. Why not try it cold? Refreshingly excellent! Ingredients Honeybush*, orange rind* (17.5%), pineapple*, natural flavourings, coconut* (1%) For more information on product labels, please contact our Customer Service department. The information on the labels of the products may vary for reasons beyond our control, therefore, there may be discrepancies between the information on the site and that on the products delivered. Please always check the information on the product before consumption or use.